90 Posts to Drive Change. 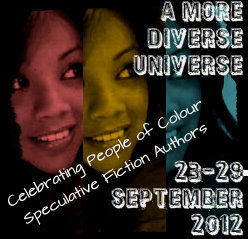 When I first came up with the idea for the A More Diverse Universe tour, I never thought it would grow so huge. There was not much planning involved, the time frame for describing it to everyone and encouraging people to promote it was very tight, and the sign-up time frame was really close to the actual week of activity. Many, many thanks to Vasilly and Heidenkind who were instrumental in pulling this event together. Thanks to Kailana for stepping in to help when I asked her at the 11th hour. Thanks to Alex and Anachronist for the buttons. Thanks to everyone who signed up on GoodReads and to everyone who spread the word on Twitter. Thanks to Care for the fantastic #diversiverse hashtag! And thanks, most of all, to everyone who participated. The response was amazing. I cannot even describe the feeling - I hope I don't need to because you all probably have the same one, a thrill when you see a schedule that goes on and on, at links and tweets and posts and people that were not originally part of the event but wanted to be involved so participated, anyway. Of so many authors that are now just a little bit better known than they were before, and are on so many more wish lists and Buy Instantly lists than they were before. Of so many books that you have read and inspired others to read and that they will then read and inspire others to read in a virtuous cycle that, we hope, will never end. I struggled with calling this a Wrap-Up post because things like this should never be wrapped up. #Diversiverse is only a week long, but that's not where it ends. It is the impetus. It's up to you to internalize it. Did you find an author you liked? Read more of him. Tell others to read him. Did you add books to your wish list? Buy them. Tell others to buy them. Because, as I've said before, reading is a political act. It's an economic act. It's voting with your dollars and with your time and with your word-of-mouth power. And if you want to see less white-washing and less stereotyping and more diversity and more fresh thinking, then you need to prove it with your actions. 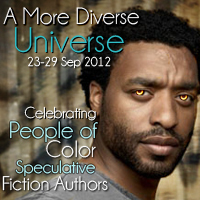 This won't be the last A More Diverse Universe reading event. We'll do it again, and try to make it even bigger and better than this go-round. 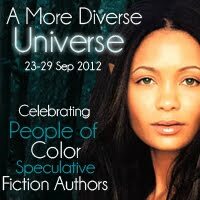 But in the meantime, please look at the #Diversiverse schedule and read some of the many books featured. Thanks for hosting this awesome event! I haven't gone through everyone's posts yet - but I fully intend to this weekend, and I already have quite a few books (authors) added to my reading list because of this event. This was really a fantastic idea. I totally would have participated if life wasn't so crazy right now. And yes, I placed one library hold (Shaun Tan) thanks to this event! Thank you for hosting this event, Aarti. While I didn't participate, I've been reading some of the posts and learning about facets of the speculative fiction/fantasy genre I'd never heard of. I've added some great titles to my list. You did such a fantastic job and really raised profiles of some fab authors. Successful blog tour I think. Thank you for coming up with this event, and thanks to everyone who made it possible! I've added a ton of books to my wishlist and had lots of fun. It was a great, thought-provoking week. I didn't take part but it's been a great week, and I look forward to next time in the hope I can! Have added a good few books to my list. I love that it's spawned lists and lots of information for those who want to diversify their reading more. Now that I'm back to blogging I expect I'll spend the next few weeks slowly going through all the posts and adding to my TBR pile. Thank you for organising such an amazing event, Aarti (and Tasha and Vasilly). I look forward to being a part of it next time. Thanks for hosting this event, Aarti, and to all those who hepled organize it. I have added new-to-me authors and many books to my TBR list. I can't wait for the next event and intend to keep expanding my diverse universe. This was such an amazing event and you did such a great job getting everything together. I've never added so many books to my TBR! Thank you Aarti for everything you did for this. So so so glad the turnout was amazing. Looking forward to reading more of the reviews. I wasn't able to post mine because I had my hands full this weekend, but I'm planning a late-to-the-game post this week. Excellent work, everyone! You did a great job! Thanks for hosting this, Aarti!! It was a lot of fun to pick a book and a much-needed event! It was fun! I'm sorry it ended up in the middle of my convalescence and I didn't take part in the blogging/reviewing but it was a nice impetus to remind myself to make sure I'm reading authors from all ports of call. Just finished Octavia Butler's "Parable of the Sower" for a Wiscon inspired book club. Not that anyone needs an excuse to read Butler's work. And I've blogged about and linked to your posts because the more participation and energy the better. Again, thank you for a more diverse universe, and for an excellent blog. Thanks, Kathrin! I really appreciate your comment and your encouragement! Yes, we'll probably do this again - not sure when, but definitely again! This was a brilliant event and thank you for organising and inviting everyone! I've discovered so many new authors and my wishlist has grown. Looking forward to the next one!